We've decided to start reviewing reviews. We'll see where this goes, I'm sure this will encourage some shenanigans on Yelp but we'll take the risk. "slice of cheese pizza.....for the price of $3 or $5 for two"
We had those prices for about a week in January when we first started. Have you been working on this review for the last 3 months? It shows that it was posted 4/6/2010. Must be a relief to have finally finished the SliceTruck review that's been looming over your head. "drink options are also pretty small and pretty expensive"
Our cans of soda and bottles of water are 12 ounces and they cost $1 with sales tax included. I'm from outerspace. "a $5 slice of pizza just seems way too much no matter what sort of fusion fancy pants stuff you're putting on it." For 2 days we grated white truffles over mushroom slices and sold them for $5 a slice. White truffles are super expensive and we lost money making these. This was in March. On a positive note, thanks for rounding up your stars. SliceTruck's review of your review: F because it was late. If this was posted in January when you tried the truck I'd give it a C-. Main problem with this review is that you never explained why it wasn't very good. 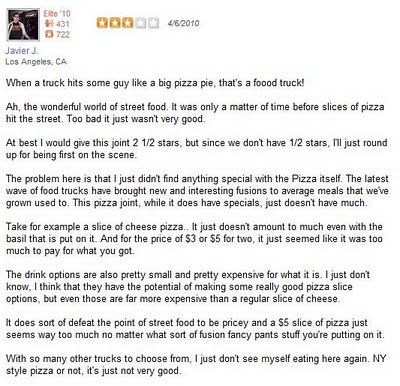 The best way to support our reviewed reviews would be to post a 5 star review of SliceTruck each time we post one. Definitely buy the pizza though too. There's tons of material on Yelp that needs reviewing. You could go all day. I was considering starting a site dedicated to it. You do realize 3 stars is still pretty good. But hey, if you want to be nitpicking, I have a good 67 reviews that are in a state of undone. I start them out when I try them and well, when you have close to 1,000 reviews, maybe you just spread them out. Sorry feedback wasn't quick enough for you. I also like how you point out how Yelp needs reviewing but right before that, you point out how people should just write 5 star reviews... So you're encouraging non-honest reviews yourself? You also can reach out to your customers via yelp that weren't left satisfied instead of just putting them out blast on your site, but hey.. that would actually be some semblance of good customer service.